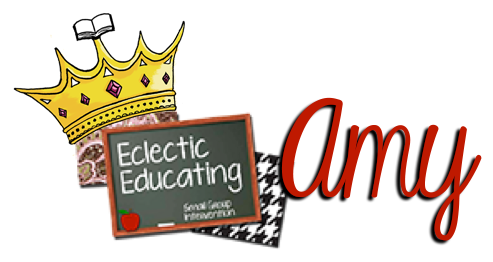 With most of us on summer vacation, I know many are rethinking the structure of their classroom and already planning for next year! 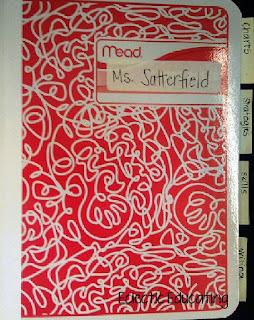 Today, I would like to share how I use reader's notebooks with my students. After searching through Pinterest and numerous teacher blogs, I decided to craft my own version of the reader's notebook. I combined a variety of ideas I had seen all over the internet, tweaking them, and making them my own. They have become my pride and joy over the course of the school year. My first problem was how to get the notebooks. Since I am a Title 1 intervention teacher, I do not send out a supply list. Fortunately, I have a very good friend over at Mead. He was generous enough to get me plenty of free composition notebooks for all my students. They even came in fun designs. It was a dream come true! 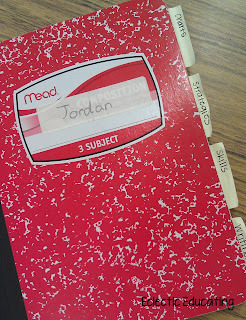 Once I received the notebooks, I put a label on the front for each student's name. 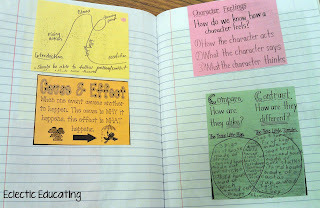 Then, I used small post-its to label four sections: Charts, Strategies, Skills, and Writing. On the first page of each section, we kept a running list of what could be found in that particular section. I found that keeping this running list forced students to stay organized and helped improve students' understanding of terms. For example, students were more likely to remember what the literary term "theme" meant because we had written it several times in our reader's notebooks. Repetition is key! If you have ever read my blog before, you know that I love anchor charts. For this reason, the first section in our reader's notebooks was for charts. With each anchor chart I made, I took a picture and made copies for my students to glue into their notebooks. Sometimes the charts required my students to fill out information during the lesson, but other times they did not. I found this section to be extremely beneficial to my students. 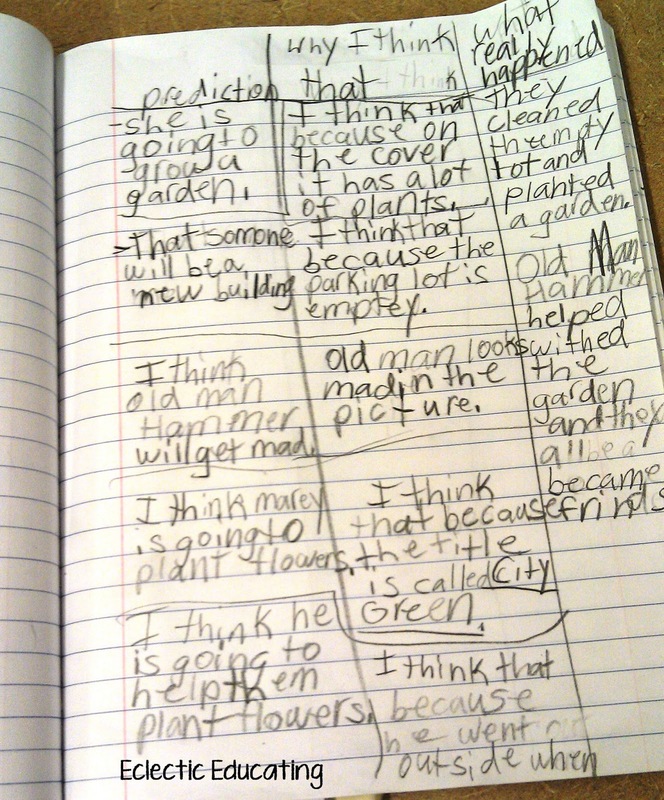 Instead of always asking me questions, my students began looking up the information themselves using their notebooks. They really took ownership of the material. 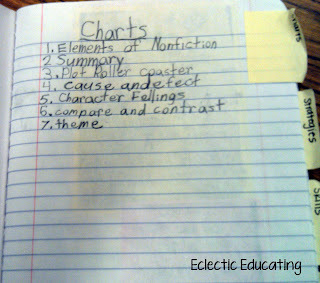 The second section in the reader's notebooks focused on reading strategies. I explained strategies to my students as things they should be doing in their heads whenever they are reading. 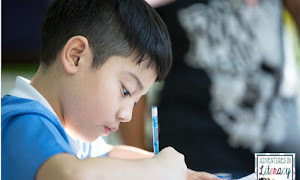 These include making predictions, making connections, synthesizing, determining importance, etc. 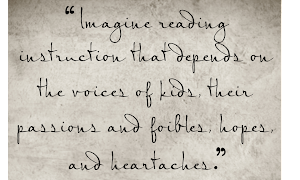 Many of my struggling readers do not use these strategies in their reading. As a result, I focus on teaching these strategies explicitly. The third section of the notebooks is used to work on various reading skills. These skills can include character traits, cause and effect, compare and contrast, main idea/supporting details, etc. 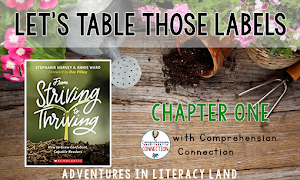 I explain skills to students as various ways students will need to analyze texts. They will not have to use these skills with every text, but should know how to use them. 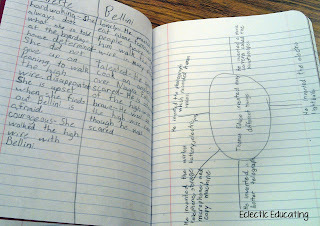 Within the final section, students worked on written response in their reader's notebooks. 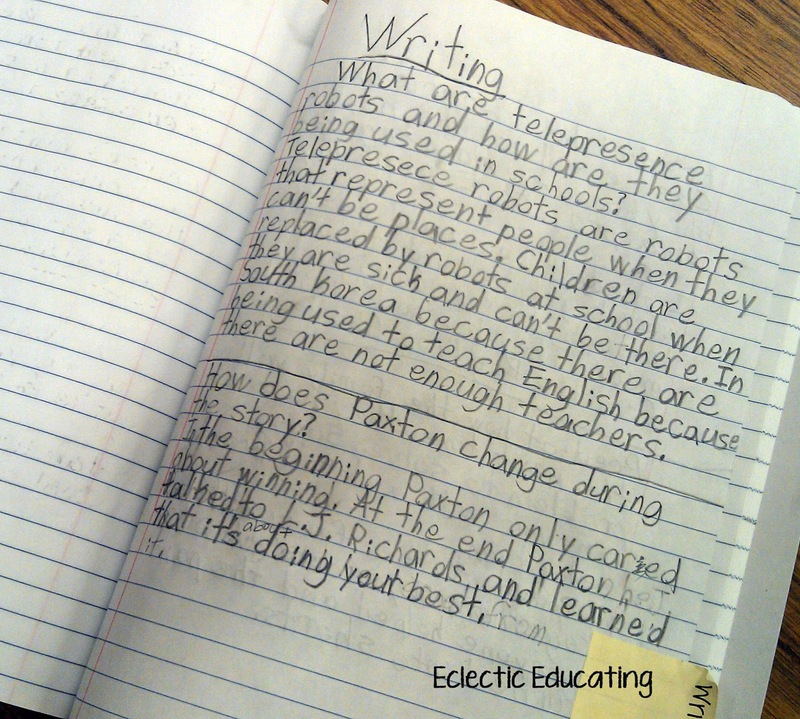 I really wanted to reduce the amount of written questions I worked on with students - quality over quantity. For most articles and books, I would come up with 1-2 questions. 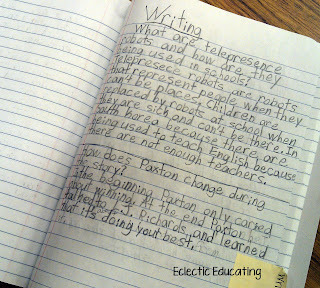 Students would record the questions in their notebooks. Sometimes we would answer the questions together, and sometimes students would answer the questions independently. With these questions, we really worked on the wording of our responses and using evidence to support our answers. I believe I saw a great improvement in the quality of my students' written response as a result of this section of the notebooks. I fully intend on using reader's notebooks again next year. Students responded very positively to the notebooks. They loved the fun designs, and definitely preferred them over any type of worksheets. The notebooks just seem much more open-ended. My students are all very excited to take the notebooks home over the summer. Do any of you use reader's notebooks? If so, how do you structure your notebooks? 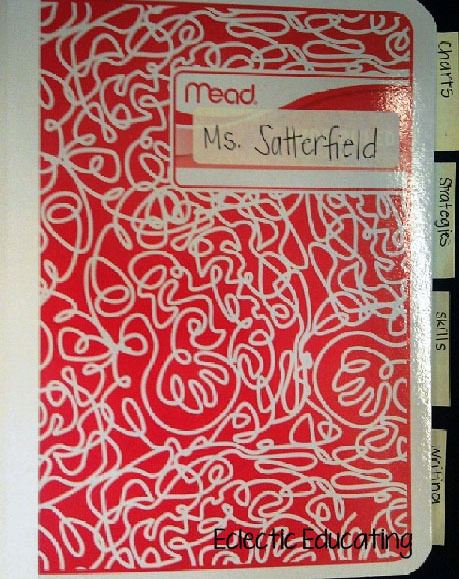 I wanted to use reader's notebooks this year, but was so confused as to how to set them up! This definitely gave me a better idea about how to structure them. Plus, that friend at Mead is pretty cool! Thanks, Amy for the ideas and pointers. 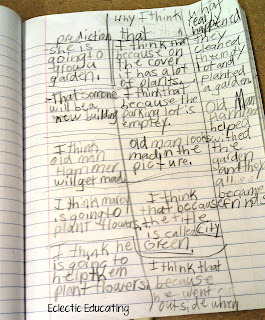 I am planning to use reader's notebooks this year with my students. I think it will help them with their thinking in a more effective manner. We've ordered very lovely pink books for guided reading next year. This is where they will record all the work they do when working independently during guided reading time so that they can share at the end of the session and so I have a more permanent record of evidence of what they have achieved. I like the idea of splitting it into sections for different things - did the post its not get tatty? Surprisingly, the post it's did not get messed up. They lasted the entire year! You could always tape something sturdier like cardstock if you wanted to. Thanks so much for the organizational tips! I have been using these types of notebooks the past 2 years and still haven't quite found my stride with them but I think your post may help me tie it all together! I am so glad you found the post helpful! 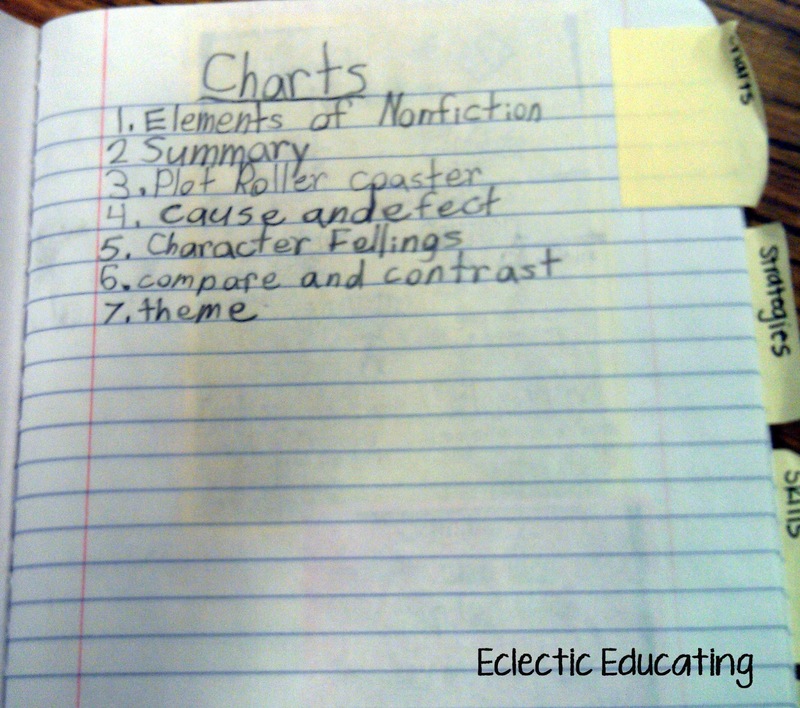 I love the idea about taking pictures of the charts and having them glue them into their notebooks! That was definitely one of my favorite parts of the process, and very useful, too! Love this post! 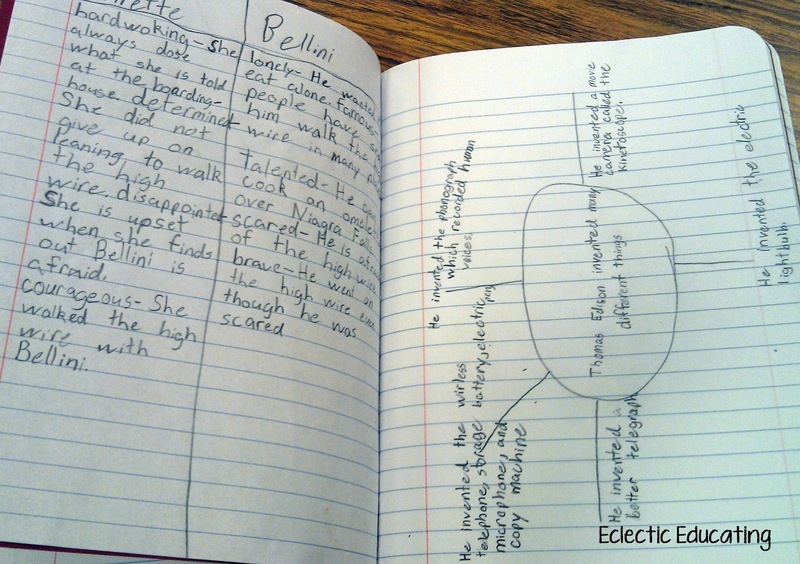 My readers' notebooks are divided into three sections: Skills & Strategies, Vocabulary, and Responses. What a brilliant idea - to photograph the anchor charts and include them. Thanks! I think I'm going to do just these three sections this year too! Do you teach 4th? 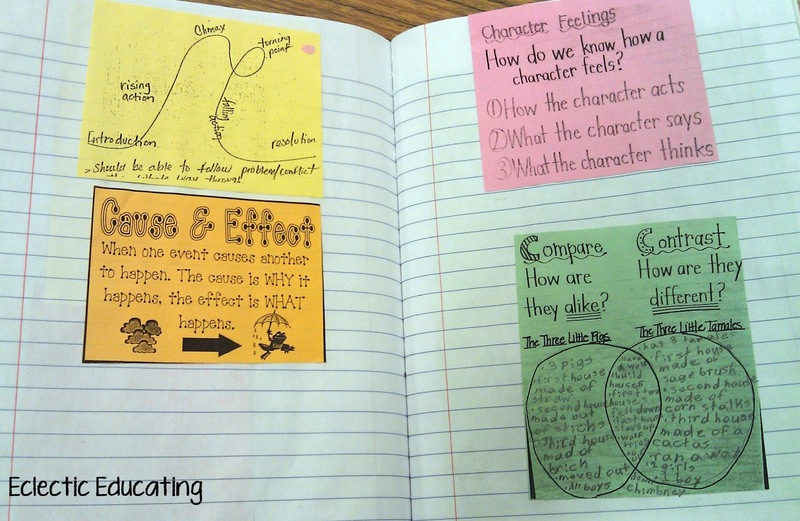 Great idea with the anchor charts in notebooks, I'm sure just gluing is much faster than writing it. Last year was my first year teaching 4th & I did way too much! This year I'm going to keep it simple, like Wendy, do three sections: skills & strategies, vocab, and reading response! Using the readers notebook persistently throughout the year is definitely a goal of mine this year!